Kawaihae was a royal center where Ka‘ahumanu, Kamehameha’s favorite wife and an accomplished surfer, was known to have ridden the waves while in residence there with the king. Since those days, little or no surfing took place at Kawaihae until the early 1970s. A few local surfers rode the breakwater, but it was not until the early 1980s, with the rebirth of longboards, that Kawaihae became the popular surfing mecca that it is today. 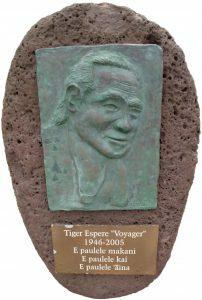 In 1992, well known waterman Tiger Espere created the “Tiger Pua Ka‘ilima Longboard Surf Classic” contest. Since then, it has brought together surfers from all areas of the state to compete in an atmosphere of friendship and fun. Additionally, the contest has brought to light the awareness of the importance of this area, both as a recreational reserve and as an historical / cultural resource. Pua Ka‘ilima is the name of a small island which was once located at Kawaihae. The island was named for the ilima flower which flourished upon it. The non-profit corporation known as Pua Ka‘ilima Cultural Surf Park Inc. was dedicated to develop and protect this area on 1.4 acres of coastline at the Kawaihae Breakwater. Funded not by taxpayers’ money but rather with community and foundation support, the park will be developed to afford unrestricted ocean access, for local people and visitors in phases over the next several years. For more information on the surf park, or to make a tax-deductible contribution towards its development, please call 885-3534.